This entry was posted in Managing risks & hazards on 2018/08/08 by Susan. Make sure you can identify toxic plants if you work or play outdoors. Giant hogweed is hard to miss, but poison ivy leaves don’t always look the same. 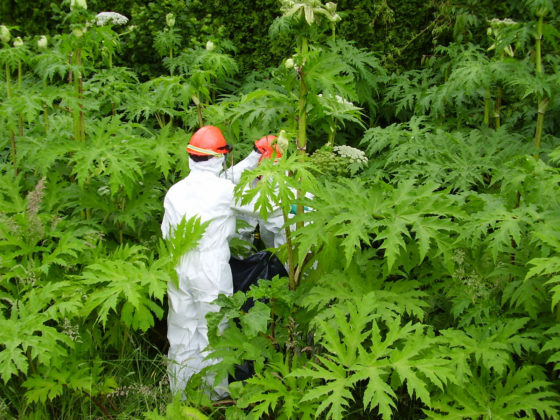 Workers in protective gear removing giant hogweed. It’s pretty easy to spot a giant hogweed plant. Recently, I read about a Vancouver Island woman who identified two of them in her garden. Ironically, these toxic plants are actually quite pretty. They have little white flowers, in clusters that form an umbrella shape, and they can grow more than eight feet tall. You can read much more information about the giant hogweed from the Invasive Species Council of B.C. Wear heavy, water-resistant gloves when handling the plants. Dispose of the gloves after use (heavy rubber gloves can be re-used if carefully washed with soap and water). Do not get any sap on your exposed skin. Wear water-resistant coveralls or clothing that leaves no skin exposed. Cotton and linen (and many synthetics) will soak up the plant sap, which can then penetrate to the skin. Plant “hairs” may also penetrate thin clothing. Wear goggles when disturbing or removing the plants. Use caution when transporting waste containing the plants. Some​ of these plant toxins are activated by sunlight. For example, if you get sap from giant hogweed on your skin, get out of the sun until you can wash it off. Do NOT rub your eyes; sap from this plant is known to cause blindness. Unlike giant hogweed, poison ivy is not so easy to identify. It takes different forms in different environments, and doesn’t always look the same, warns this NPR article: Don’t touch! A scientist’s advice for spotting poison ivy before it ruins your summer. Other toxic plants in B.C. Giant hogweed and poison ivy are only two kinds of toxic plants found in B.C. that can put people at risk. See WorkSafeBC’s Toxic Plants page for more information on others. Also read my post about a landscaper who got some nasty-looking blisters from a euphorbia plant. All that said, I hope you have a nice time enjoying the outdoors, as summer flies by. Do you have any toxic plant stories to share? I hope you don’t – but if you do, let us know in the Comments below.